Check out these rolling stones. Wikimedia CommonsA pair of sailing stones on a journey across Death Valley National Park. Death Valley National Park is the hottest and driest place in North America. Its barren surface gets less than two inches of rain per year, making it an almost uninhabitable place. Yet there are signs of life if one looks closely enough. Across the playa creep tortoises, coyotes, and other animals that have adapted to the heat and drought. But perhaps the most mysterious things to move across the playas of Death Valley aren’t animals at all. In fact, they’re not even alive. WIkimedia CommonsTwo sailing stones that diverged from each other on their treks. 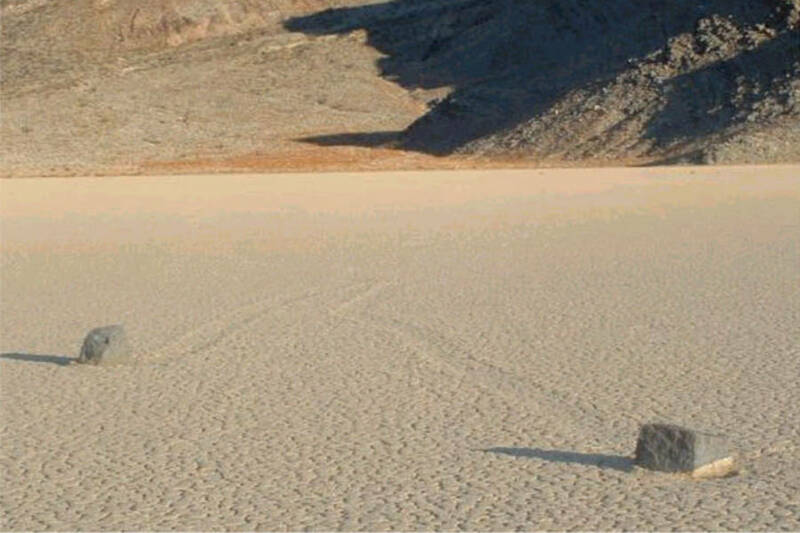 In 1915, the first sighting of the sailing stones was recorded. A prospector named Joseph Crook visited their environs – the Racetrack Playa section of the national park – and was shocked by what he saw. He described seeing boulders, some as large as two feet in diameter, appearing to roam across the desert on their own. As his story spread, geologists from around the country flocked to Death Valley to see these roaming rocks for themselves. 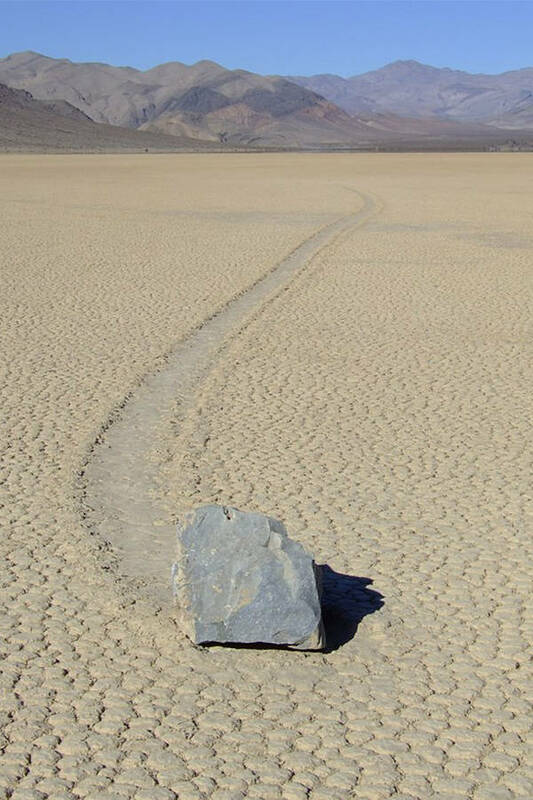 They dubbed them “sailing stones” for the way they appear to sail across the desert. As they mysteriously move, the stones leave a trail behind, etching patterns in the sand. From above, the lines reveal an even deeper mystery. Rather than move aimlessly around the desert, the stones tend to mirror each other’s patterns and move in sync. They often turn at the same angles and run parallel to each other through the sand. Overall, the effect is mesmerizing. Even more surprising is the speed with which the sailing stones move. Rather than a few inches per day, as one would expect from a transient rock, the stones can move at speeds of up to 16 feet per minute. 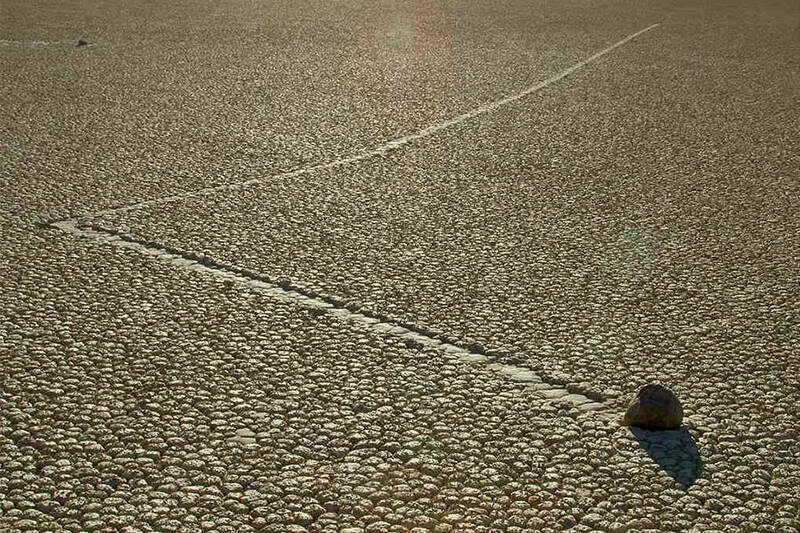 For decades, the mysterious movement of the sailing stones baffled geologists. How could these rocks, some so heavy they’d be hard for a human to move, glide so smoothly across the surface of the desert, unassisted by people or animals? 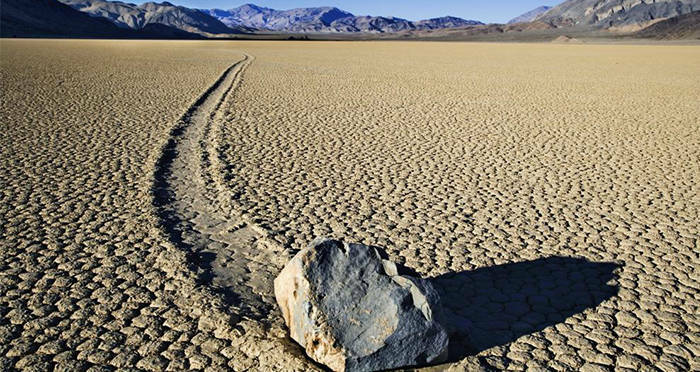 Paleooceanographer Richard Norris describes the phenomenon of sailing stones in Death Valley. Early hypotheses proposed wind as a possible explanation, stating that if the force was strong enough, it could drive the rocks across the playa. Other geologists theorized that even the minimal rainfall the desert received was the reason, stating that it created mud that allowed the rocks to slide. Some geologists theorized that it was a combination of both. In 1972, geologists Bob Sharp and Dwight Carey began a stone monitoring project that involved an extensive labeling and observation processes. Over seven years, the team marked individual stones, recorded their progress, and tracked their trajectories. Their research revealed that most of the sailing stones’ movement came during the winter, leading them to believe that ice played a part. Unfortunately, they had to end their research before making a definitive conclusion. In the early 1990s, additional research done by students from Hampshire College and the University of Massachusetts at Amherst revealed that the movement was indeed caused by ice, though they added that wind was also a factor. In order for the sailing stones to sail, they needed a perfect combination of the two. The tracks the stones leave can go on for several hundred feet. Finally in 2009, the mystery of the sailing stones was solved for good. Researchers discovered that ice is a cause, but that the stones are helped along by another factor no one had considered before: the sun. On the rare occasion when it does rain in Death Valley, the water is quickly absorbed and stored in the ground. In the winter months and in the cooler spring and fall, when temperatures drop the groundwater freezes. As it freezes, it rises to the surface, creating a paper-thin sheet of ice beneath the rocks. Then, as the sun rises and warms the ground, the ice melts, creating rivers of water that push the stones across the playa. They only stop when the water dries, or when the water freezes again. If a stone reaches a particularly dry area, the stone will cease to move. Though the mystery of the sailing stones has been solved, it doesn’t make them any less interesting. The idea of seeing inanimate objects roaming aimlessly and creating mirroring patterns in the sand is still a sight to behold. After learning about the sailing stones of Death Valley, check out these intricate Tibetan sand paintings. Then, read about the Aral Sea, once a desert oasis that’s now just a desert.